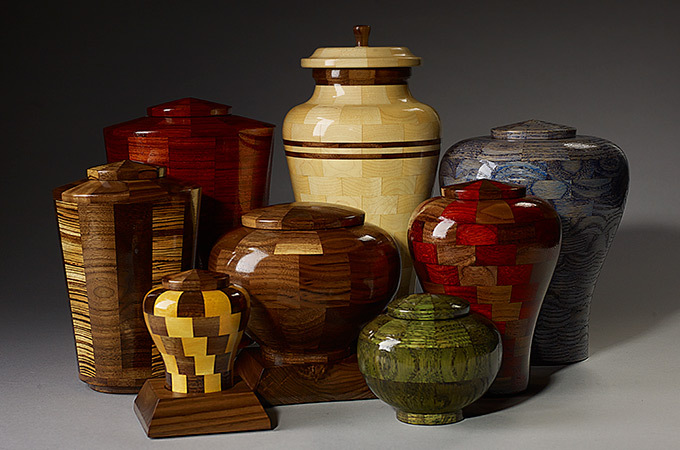 We proudly present to you a new collection of artisan crafted hand turned wood cremation urns. 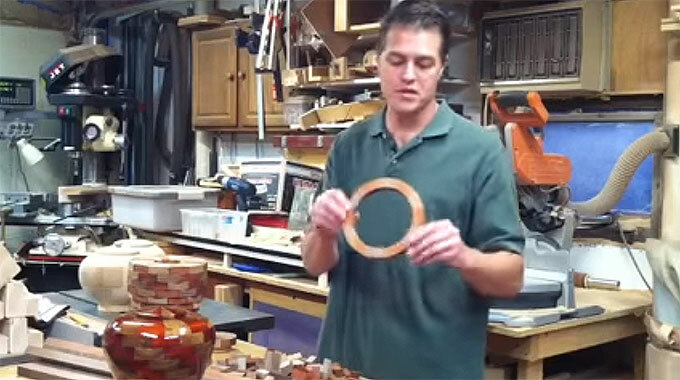 Individually woodturned in the USA by a skilled artisan, each urn is made from segments of solid, premium wood in a variety of designs and styles. Each wood piece is chosen for quality and grain patterns, layered in alternating patterns that create a mosaic which highlights both the ingenuity of the craftsman and the grace of nature. 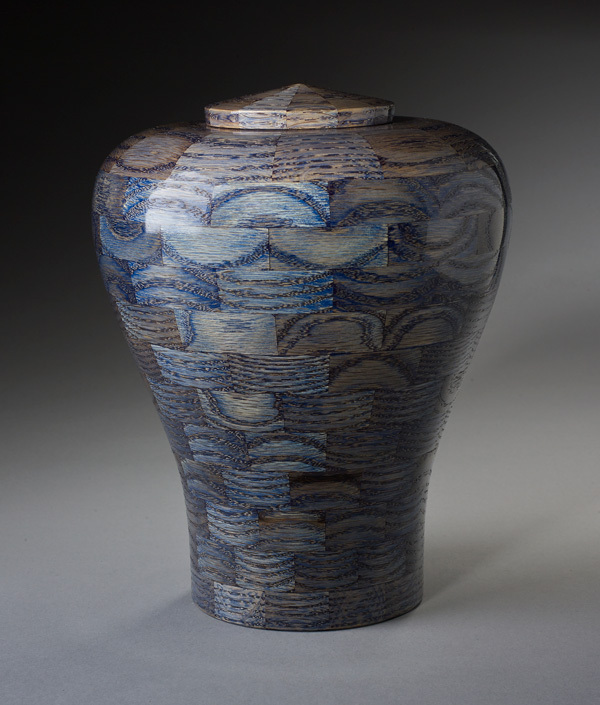 WHAT IS A HAND TURNED URN? A hand turned urn is a cremation urn made by the craft of woodturning. Woodturning is a type of woodcraft that creates products using a lathe. The lathe spins the object, while the artisan holds a stationary tool and applies the tool to the spinning wood surface to shape and accent the wood piece. For this collection of hand-turned wood cremation urns, each urn is built from smaller cut blocks of wood which are assembled into a ring. Multiple rings are layered, one on top of another, to create the urn vessel with open interior for the remains. 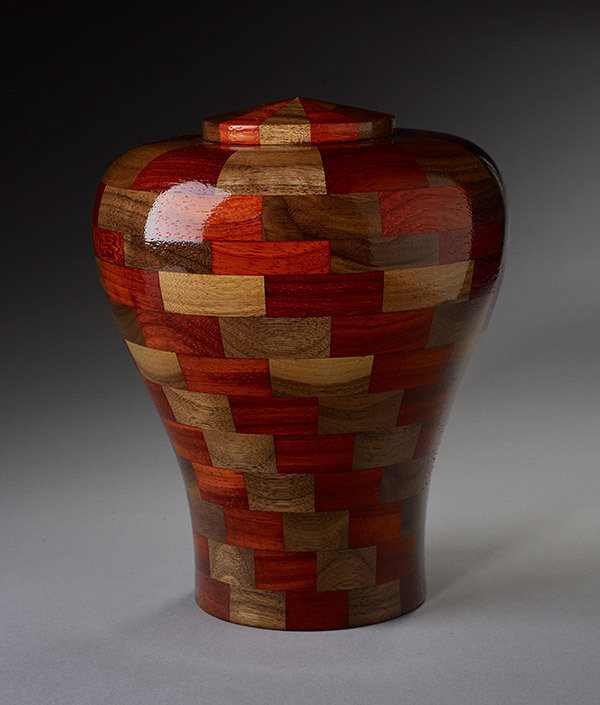 The urn is a jagged collection of layered wood blocks at this point, so the artist takes it to the lathe and hand-turns it until rounded perfectly. Sanded, polished, and finished by hand, the final touch is a urethane glaze which preserves the wood and gives it an illustrious shine. 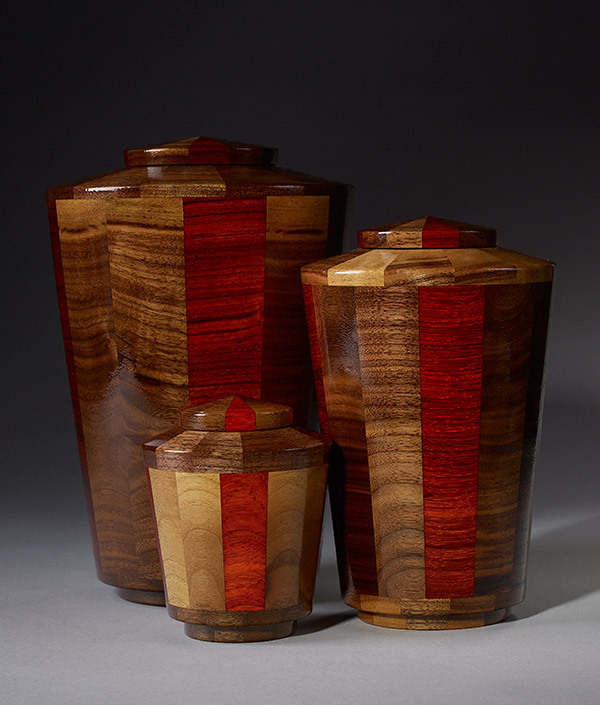 Here is a sampling of some of our favorite designs from this collection of hand turned urns. You can view the complete collection here. Alternating sections of black walnut and exotic padauk wood make a bold statement. As with all of our hand turned urns, each segment is chosen for elegance and symmetry of grain pattern to create a beautiful work of woodturned art. The graceful shape of this wood urn allows full expression of the woodgrain patterns. Crafted from oak wood which is dyed blue, this colorful memorial showcases the wood in a way that exhibits both the woodturner’s craft and the organic beauty of the natural grain figures. Long strips of black walnut wood are complimented with a gorgeous stripe of zebrawood. Crafted in an expansive tower shape, the urn portrays a sense of strength and potent action. 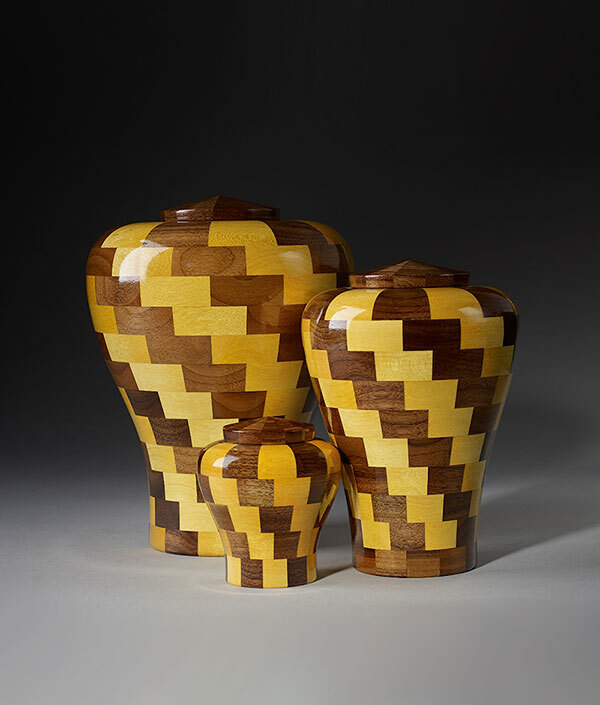 Black walnut and yellowheart woods are composed in an rising pattern of alternating colorful wooden blocks, rounded to perfection on the woodturner’s lathe. The robust shape conveys dignity, harmony, and joy in honor of your loved one. 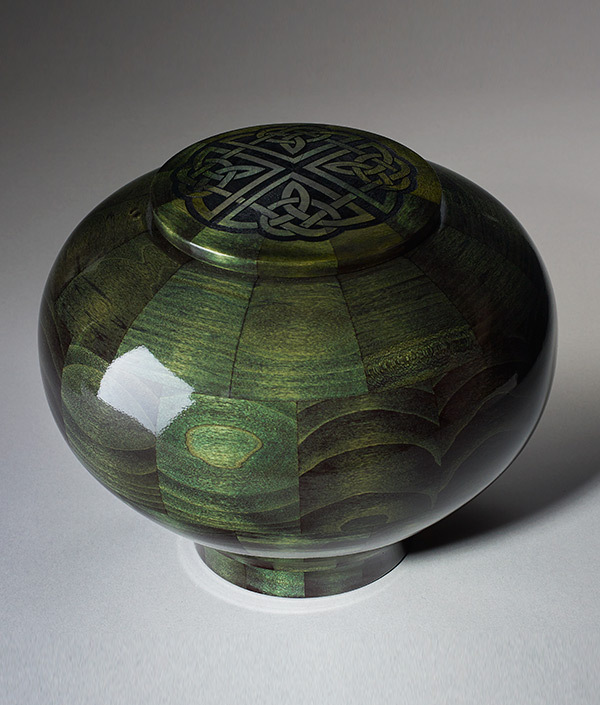 Poplar wood segments are artfully composed into a round vase shape, laser engraved on top with a gorgeous Celtic Knot design then dyed a brilliant yet earthy green. 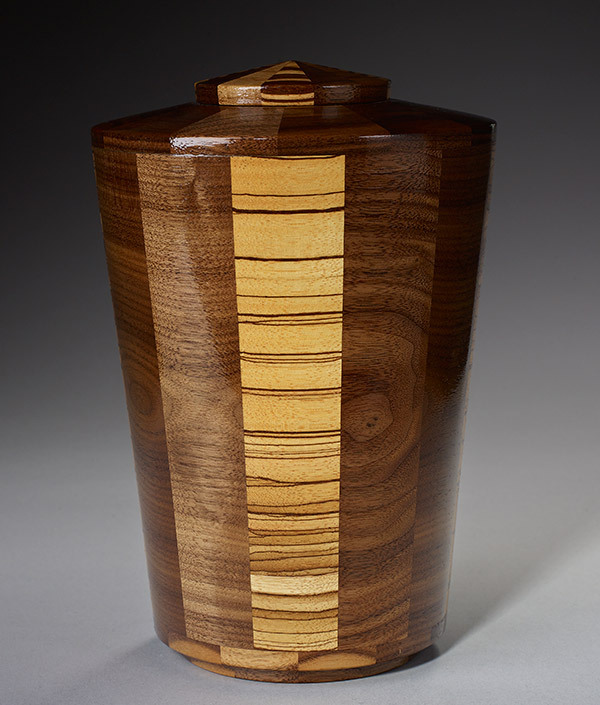 This is an unparalleled hand turned wood cremation urn with an Irish flair. 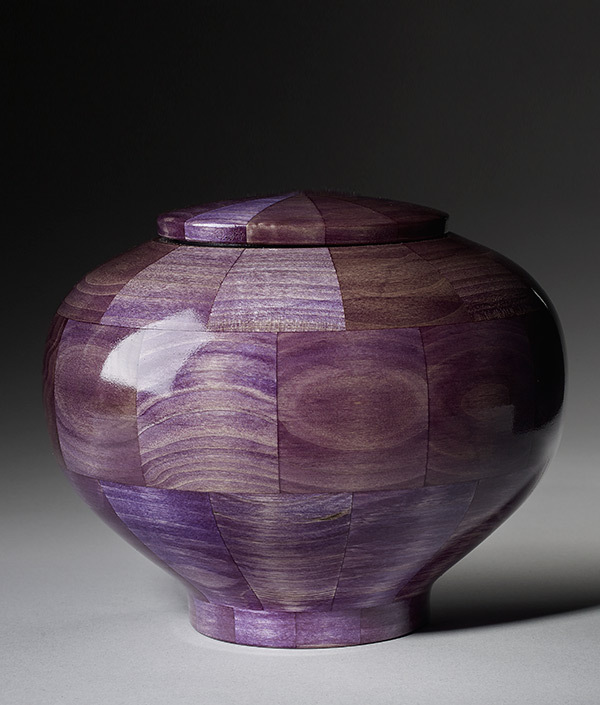 Segments of poplar wood shaped into a sphere, woodturned by hand and completed with a natural purple dye then finished with a protective glaze. Available in multiple sizes. This design uses black walnut a red exotic padauk hardwoods assembled in a rising checkered pattern to convey a sense of mystery and elegance. 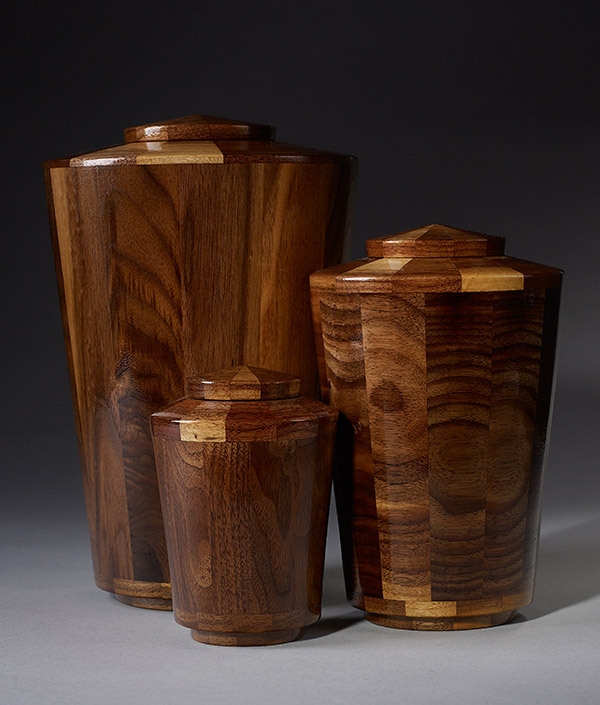 The gorgeous hand turned wood cremation urns are available in three sizes to suit your needs, and can come with optional complementing walnut wood base with engraved name plate for personalization. White maple shines out in contrast with the accents of the darker walnut wood in the base and lid of these beautiful hand turned wood cremation urns. 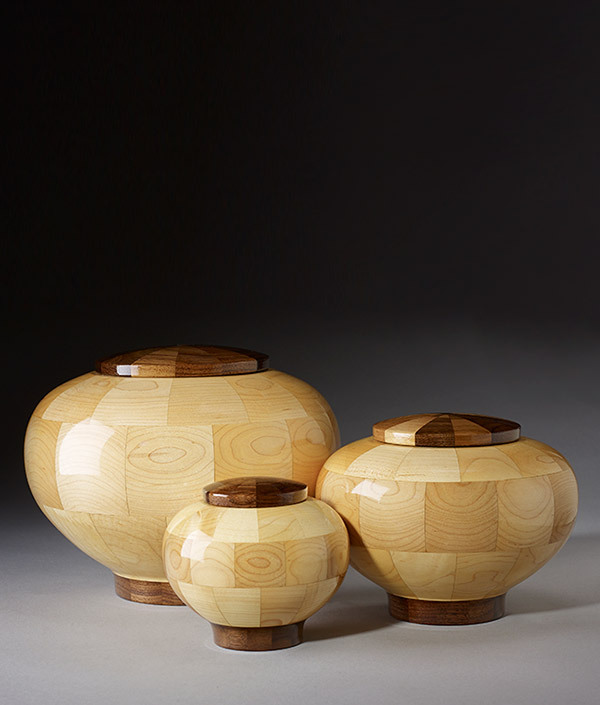 The round shape is the ideal vessel for displaying the unique woodgrain patterns of the maple wood while serving as an artistic funeral urn for your loved one’s remains. The subtle richness of walnut wood is highlighted in the simple vase design which combines solid wood strips into a unified whole. SHOP THE COMPLETE COLLECTION OF HAND TURNED WOOD CREMATION URNS – we have many more designs and styles available, and are open to custom requests for size and wood type.